Let me tell you about How Clarissa Burden Learned to Fly. It’s not a book. It’s a vessel that will transport your mind and soul to a place so rich in culture and ambience, you will soak up each page in the desperate hope that when you look up from the page you will find yourself plum in the center of Hope, Florida. This enchanting and exquisitely written story takes place over the course of only 24 hours. But what a tumultuous and extraordinary adventure those 24 hours are in the life of our heroine, Clarissa Burden. This is no ordinary day, mind you — it is not only a Summer Solstice with temperatures that peak around 107 degrees, it is a day that marks a new beginning for Clarissa, the start of a new life. Clarissa is a writer who can no longer write. Adding to this frustration is an unloving, insensitive, and abrasive husband, a barely functional pick-up truck overcome by creatures and rotting garbage (there’s no trash service in Hope), and an active spirit community. Yes, spirits. I found myself longing to be swept away, oddly enough, to this fictional but all-too-familiar place. I felt like a giddy companion along for the ride of Clarissa’s life, a journey toward liberation, independence, and self-worth. Early on, I was rooting for Clarissa, cheering her on as she tried to maintain some sense of dignity despite being barraged with mistreatment and mishap after mishap. As the novel progressed, however, I no longer felt like a spectator; I identified with Clarissa, feeling her anguish, her despair, her fear, as well as her exhilaration over the small victories she claimed throughout her day. I anxiously read page after page as the dayâ€™s events unfolded and the mysterious lives — and horrifying deaths — of the spirits cohabitating with Clarissa were laid out in detail. This is one of those books that is absolutely perfect for quiet afternoons or a day at the beach. 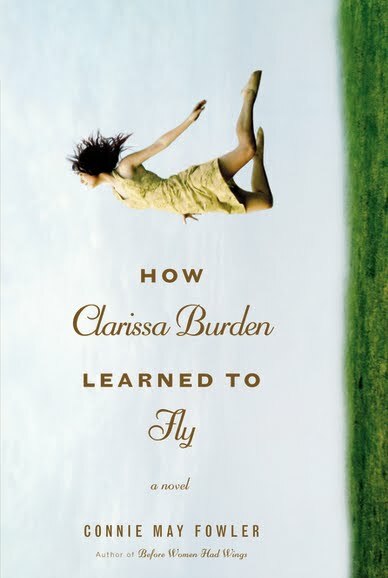 How Clarissa Burden Learned to Fly will delight you from beginning to end.